In this undated document, Dorothy Chandler describes her memories of growing up in Bullards, Oregon. 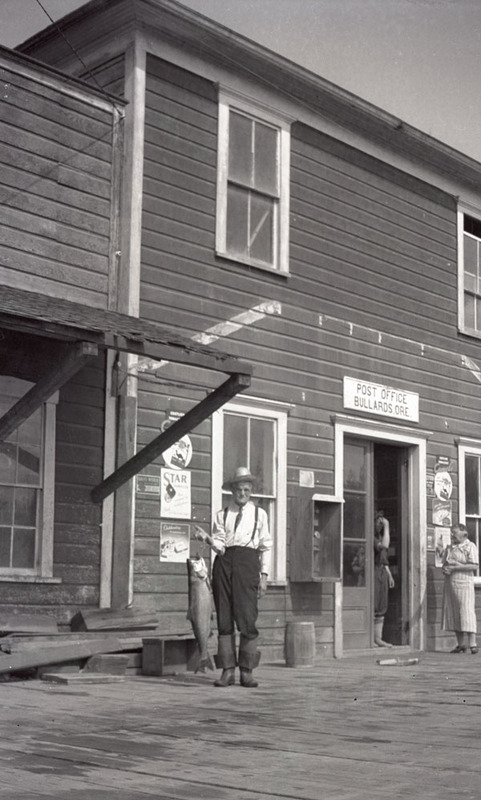 Although Bandon is my hometown, my address, until I was about 21, was always Bullards, Oregon—a post office that no longer exists. 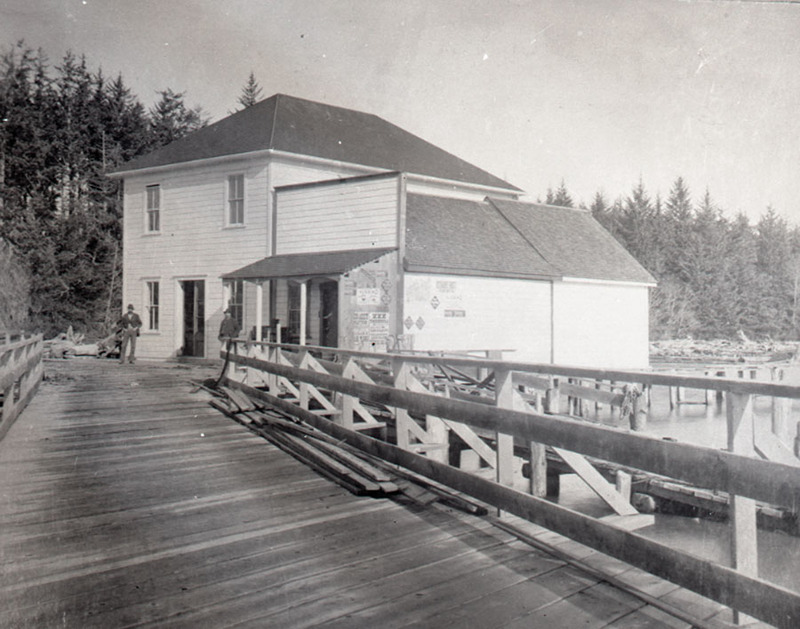 Bullards Store and Post Office was a large, two story building set on pilings in the Coquille River. 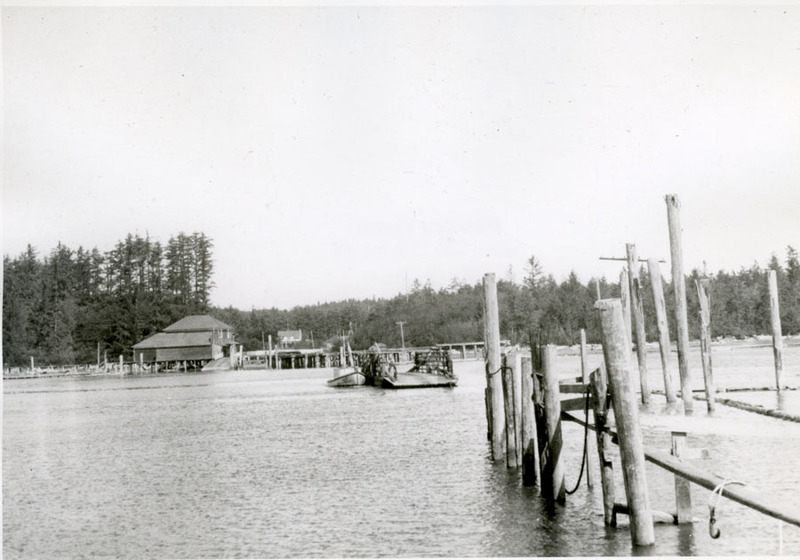 It was located on the west side of the ferry dock on the north bank of the river, about two or three miles upstream from the mouth of the river at Bandon. The tide came and scattered lots of old driftwood under the store amongst the pilings several hundred feet on both banks of the river. 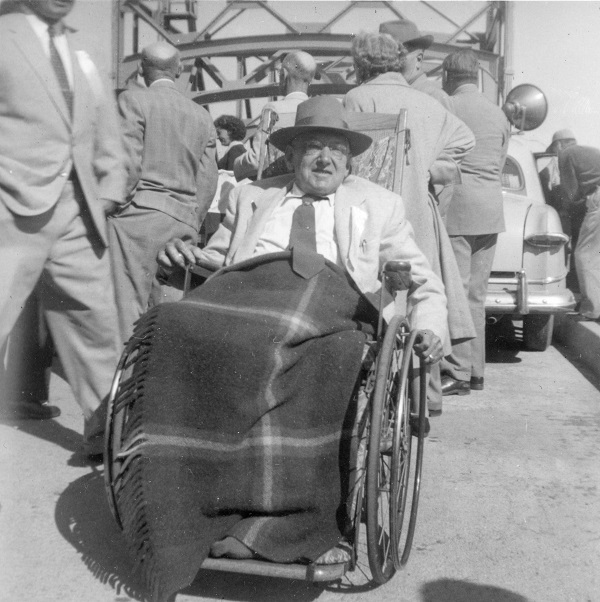 The road had been built up over the driftwood and the store floor was level with the road—no steps into the store for storekeeper and postmaster, Lester Bundy, in his wheelchair. He lived nearby, about a block and a half away, west of the store on solid ground. There was a railed wooden sidewalk built alongside the road from his house to the store so his wife, Pearl, could push him to and from the house to the store. She was a retiring, timid little dark-haired lady. She often carried her little pet chihuahua or terrier (some kind of tiny dog—I remember him being so nervous, barking and yipping a lot).Mr. Bundy was an austere fellow, with a long narrow face, thin nose and lips, keen blue eyes surveying the world through wire rimmed glasses. He always seemed old to me, with his sparse grey hair neatly combed from a side part. I was a little in awe of him and all us kids tread lightly in his store—Daddy and Mother had warned us repeatedly that we were not to horse around or play in the store. 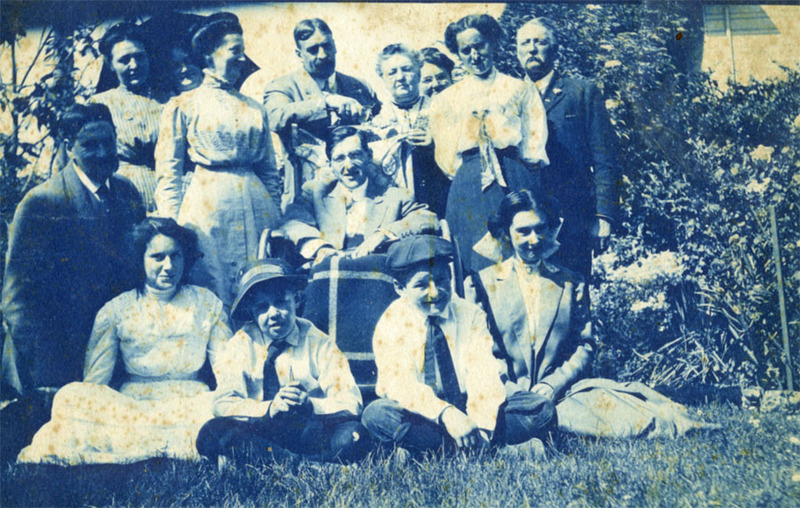 The Bundys had no children of their own. The upper floor of the store, reached by a covered outside stairway, was used mainly for evening lodge meetings and occasional community functions, as well as for elections. The door was always locked and I think I was only in there maybe once or twice. Anyway, to my childish mind the upper reaches of the store were mysterious and off limits. Many times, while waiting for our parents to get done with their talking and shopping, it was a big temptation to play on the dark, spooky stairway, but we knew we would be in trouble if we got caught—being crude wooden steps, they were noisy if you tread on them. But, we were very familiar with the public restroom at the store—a two hole outhouse underneath and at the back of the enclosed stairway. I was always sort of scared to go in there. If the tide was in, the water and driftwood would be slapping and bumping and rolling around not far below the holes and if the tide was out, it looked a long way down to the driftwood studded mudflats—a most unsanitary set-up and a potential hazard to a small child who might slip! I never heard of any mishaps in there but we always took care to be extra careful—it was usually cool and breezy too and no temptation to linger. My brother Don said the tide came in and flushed the “toilet” twice a day. Next to the store was the gas pump and a shed where gasoline, white gas, kerosene, coal oil and other such products were stored. It was kept locked at all times and a customer had to go in the store to get the key. If the customer was known to Mr. Bundy he would give him the key and let him serve himself, but if it was a stranger, either Mr. or Mrs. Bundy would go out and unlock and supervise the sale. The gas pump had a clear glass top and someway you pumped the orangish gas into this until you had as many gallons as you were wanting—it was marked—then you drained it out some way into your car. I’m not sure how it worked. On the outside of the store was also the ferry phone, in a box nailed to the building. This phone was connected directly to the ferryman’s house across the river. It was for emergencies only, when the ferry was closed from 10:00 pm until 6:00 am. (I think it was open until midnight on Friday and Saturday nights). If you needed to cross during the closed hours, you just cranked the phone several times to wake up the ferryman. The phone was attached to the wall. You spoke into a funnel shaped mouthpiece and held the separate earpiece to your ear. After getting the ferryman up, you would have to wait for him to get dressed and get down to the ferry and get the old gas engine going and then come across. It cost extra for an emergency trip—the ferry was free during regular hours. Sometime the ferryman wouldn’t take his fee—like the time Daddy had to wake him up to get Mother to the hospital when my baby brother was born—the ferryman told him to keep the money and give it to the baby for a start in life. Many a pregnant lady and her husband worried about having to cross that ferry in labor and hoped the baby came in daylight hours or that the ferry wouldn’t be broken down at the particular time. The fee for these emergency fares increased over the years like everything else—I can remember when it was 50 cents and later a dollar. I don’t know how high it eventually got. 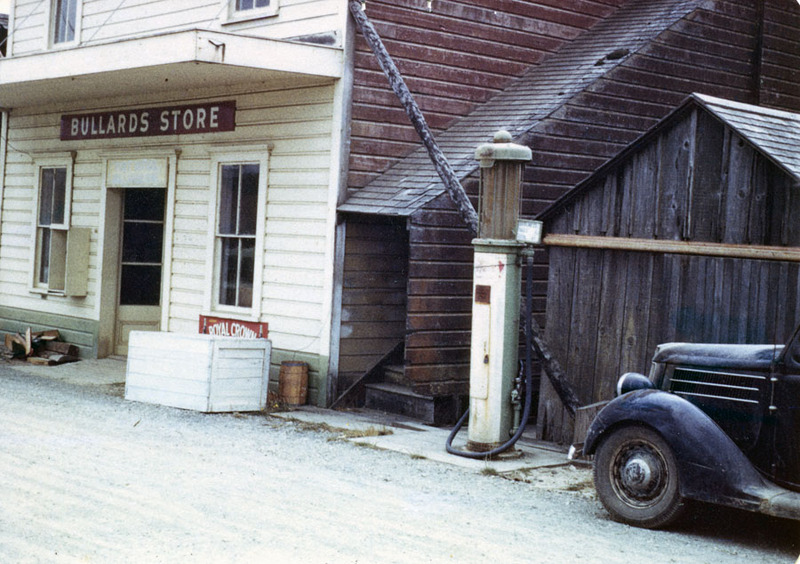 As you went in the front door of the store the post office counter and mail pigeonholes were to the left. There was a large glass up against the pigeonholes and you could see into them, but Mr. Bundy personally handed you your mail, taking it from the open side on his side of the counter. No one was ever allowed behind the counter except Mr. Bundy or his wife, but mostly Mr. Bundy was always there, in his wheelchair, a blanket covering his legs. Also behind the counter and up against the wall was his large roll top desk, the bulky imposing looking safe with its complicated looking lock, his charge account books and ledger, the bog old cash register and his telephone—an interesting instrument which sat on the counter much like a tall microphone on a stand, about 12—18 inches high, the earpiece handing on one side, the crank sticking out on the other side. He would hold it in his lap to use it. I think there was a wall phone in the store for the public to use. Rumor had it that there was a wire or string under the counter, attached to a bell in Mr. Bundy’s house and he could pull this string to alert his wife if he needed her to come to the store in a hurry or needed help with a difficult customer. I don’t recall that anyone ever took advantage of him or attempted to rob the store—he seemed to command everyone’s respect and most of the regular customers charged everything and paid by check once a month, so I don’t suppose there was ever a large amount of cash on hand. To the right of the doorway was the glass covered candy counter where we spent much of our time peering ad wishing and sometimes spending if we were lucky. When we had made up our minds, Mr. Bundy would wheel over and open the case from the back and exchange candy for our money—nickel candy bars and packages of gum, penny stick of candy and licorice and suckers. This was a favorite stop, if the school bus driver would let us off to buy—some drives would and others would only stop long enough for one person go do in and collect the mail for everyone—the school bus became the mail carrier every evening—probably not according to code but the system worked fine for everyone on the Seven Devils Road and no one complained. All around the walls of the store were shelves from top to bottom and several long counters stretched the length of the store, holding an assortment of groceries, clothing, hardware and miscellaneous items. By the time I was old enough to notice, it seemed to me that most of the things for sale were in the front half of the store, but I imagine at one time the store had been busier, before people became more mobile and traveled father away from home to do their shopping in the larger towns of Bandon, Coquille and Coos Bay. For years, our family bought all our staples there, ordering flour and sugar by the 100 pound sack, canned milk by the case when the cow was dry, buying other things in bulk—such as brown sugar, macaroni, beans, raisins and rice—Mr. Bundy would weigh out the items on his balance scale, scooping beans or whatever out of barrels or large jars or big sacks or boxes, then pouring the weighted amount into a bag and marking on the outside what it was and how much it cost. If we wanted cheese we would tell him how much and he would cut off a wedge from the huge round yellow cake of cheese which was kept covered by a glass dome. He would take his ruler and measure off so many inches for each pound we wanted, then cut it with a large, wicked looking knife and more often than not his measured piece would weigh pretty close to what we had ordered. Then he would wrap it up in wax paper and white butcher paper, mark it and tie it with a string. He had a huge spool of string on a peg and the end of it came out a little hole. He would pull out what he needed and snap it off with his fingers. I also remember seeing mouse traps set here and there in the dark corners or on the backs of shelves—baited with raisins or bits of cheese. Long-time trustworthy customers were invited to serve themselves sometimes. I remember how proud and important I felt the first time he told me to get my own candy out of the back of the candy counter! In the middle of the store was a big wood heater and on cold days it was a warm spot to stand around and visit. Because of the wait for the ferry, most people would get their cars in line for the ferry and then go into the store to visit even if they weren’t buying anything. 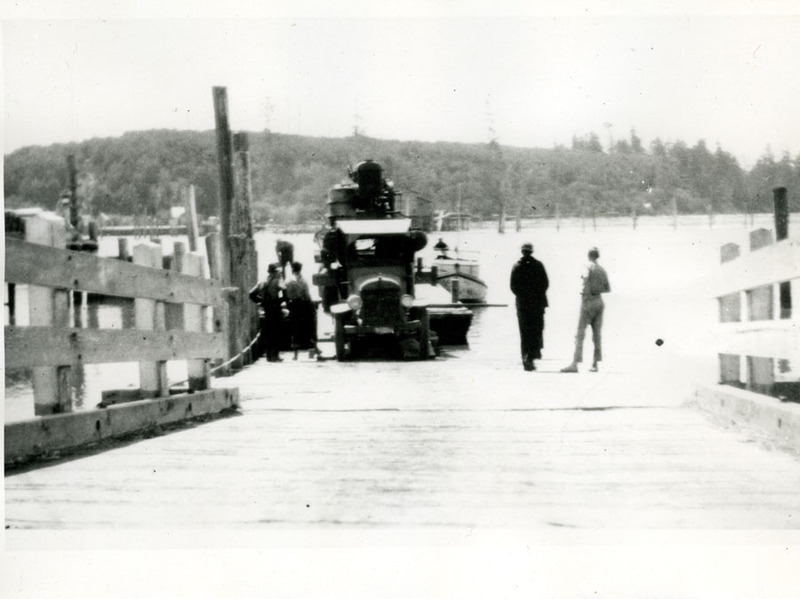 Then when we heard the ferry dock and the cars coming off, everyone would scatter to their cars to get on the ferry and by then those who had just got off the ferry would be coming into the store for mail and shopping, gas, etc. Mr. Bundy was interested in all the news items people talked about and would pass on messages and community news to everyone, so a stop at the store was a necessity for keeping up on the news if nothing else and the only local newspaper was the weekly Western World in Bandon. The state of the world and the national politics as well as local were well discussed around the heater. Funeral notices and criminal wanted notices were tacked up on the wall by the front door. Mr. Bundy, along with my dad and several other men, formed a committee to get a bridge to replace the ferry. Many of their meetings were held in the store or at Mr. Bundy’s house. Getting the bridge was a lengthy struggle, with lots of petty politics, many meetings and much politicking over several years. I even got involved because I could type. I helped Daddy compose a letter to Senator Wayne Morse stating our case for a bridge. I typed the approved committee letter and Mr. Bundy mailed it from the Bullards Post Office and Senator Morse eventually was instrumental in getting the bridge built. In the process of making way for progress, his old store had to be torn down to make room for the bridge approach and widen the road, as Highway 101 changed course to come across the new bridge. A new small store was built closer to his house with a big parking lot. The post office was also moved there. But with the traffic zipping off the bridge and zooming past, fewer and fewer people stopped at the store. Mr. Bundy was getting older, too and it wasn’t long before he retired and closed the store of good. Our address became a rural route out of Coquille—Rt. 1, Box 2210—and we put up a mail box. Home delivery was certainly handy, but not nearly as interesting or as personal as getting it direct from the hand of Mr. Bundy. And it came every day whether we were home or not—also, we didn’t get to be good neighbors by picking up and delivering our neighbors’ mail for them. So, even though progress came there was still a lot of good to be said for the old way of doing things. Today, Bullards State Park entrance is about where Mr. Bundy’s new store was located. It was finally moved or torn down. I believe his house was used for a caretaker’s cottage. The Bullard family was related some way to Mr. and Mrs. Bundy and owned a lot of land there just north of the river and on out to the ocean and the lighthouse. Now all of it is in the park, one of the nicest overnight camping and picnicking spots on the coast. There is not sign of the old Bullards Store that played such a large place in my childhood—just a few pilings still standing to remind us of the building they once supported. But, though it is not there, it will always live on in my memory—for instance the time we were planning a family vacation to Yellowstone and Daddy had ordered new tires from the catalog. They were slow in coming and we were getting worried that they wouldn’t get there in time and couldn’t go on our trip. Mr. Bundy sympathized with us and watched as eagerly as we did for the tires. When they finally did come, just two days before we were to leave, he had the mail man put them in a prominent place just inside the glass door so we could easily see them the minute we got to the door—or if we’d gotten there late and the store was closed we would be able to see that they were there and come by his house so Pearl could go unlock the store and give them to us. And I remember when I graduated from high school that Mr. and Mrs. Bundy gave me a graduation gift. They were a part of my life I sort of took for granted at the time but appreciate more in retrospect. Those were the days of the 3 cent stamps and the penny postcard. I really kept Mr. Bundy busy one summer—I must have been about 13 or 14. I invested in about 25 to 30 penny postcards and sent off for all sorts of “free” pamphlets, brochures, recipes, etc. My mail certainly increased and kept him busy when my replies began coming in. There wasn’t as much junk mail in those days, I don’t believe, but I made up for it that summer!